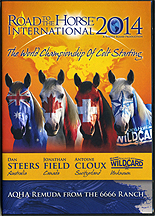 Relive the excitement and emotion as a 2014 Ram Wild Card Winner is named and immediately joins Dan Steers of Australia, Jonathan Field of Canada and Antoine Cloux of Switzerland to choose a 6666 Ranch Colt from the largest AQHA Remuda to enter the Road to the Horse arena. See the different training styles from the best seats in the house as these 4 international world-class horsemen build a partnership with their colt in the WW Round Pens in just a few hours. The competition is tough and the race is close as the competitors face the final challenge, the famous and wildly designed Road to the Horse Obstacle Course. Professionally produced to take you up close and personal, you will want to watch again and again. Road to the Horse international 2014 is packed full of expert horsemanship, excitement, emotion and reminds us all that dreams do come true.